Lennard Longhorns 2019 softball team. Front row, from left: Ashleigh Menotti, Aniya Reaves, Elycia Cabili, Tyrah Checkley, Maya Anjodha and Lauren Robledo. Back row, from left: Kaitlyn Sigmundi, Mikaela Jackson, Kiana Bradford, Haleigh Menendez, Haley Amorelil, Kelsey Scales and Damaya Paige. 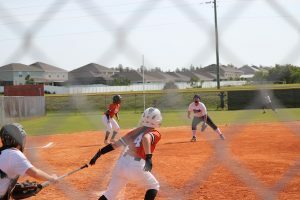 The Lady Longhorns hope to continue their winning ways this week with an April 11 home game against Braden River, the Longhorns’ main foe for the top spot in the District 9 standings. 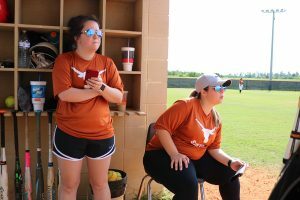 After that, coach Allison Montezuma’s surprising Longhorns hit the road for an April 16 game with district rival Brandon. Then Lennard closes out its regular season at home with three games: April 18 against District 9 cellar dweller Tampa Bay Tech; April 23 against Durant; and April 25 against Plant City. 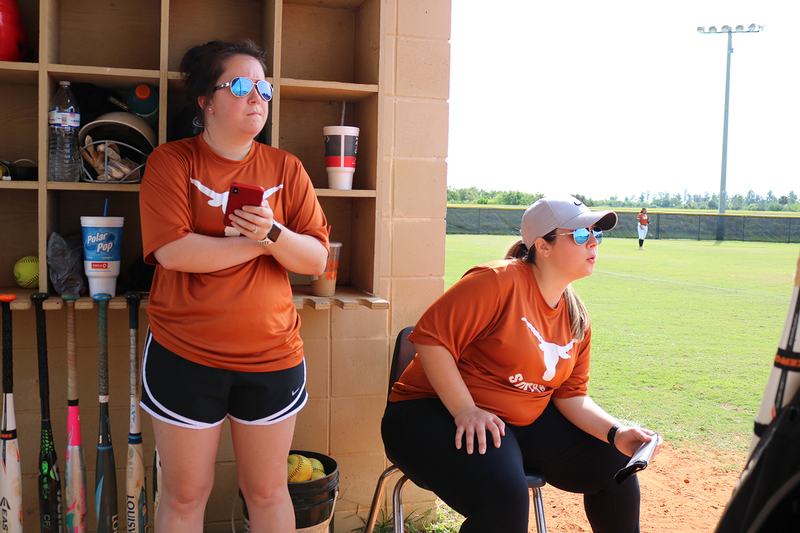 Lennard softball coach Allison Montezuma, right, and assistant coach Shelby Bowen sweat out an extra-inning 11-10 win over Hillsborough Terriers on a hot Saturday morning last week at home. Following a game against Riverview on April 9 after press time, the Longhorns, 9-5 overall and 3-0 in District 9, face Braden River in Ruskin April 11 at 7 pm for possession of first place in the District and then have another District game with visiting Tampa Bay Tech April 18. This is Montezuma’s first year as Lennard High School’s head softball coach. She hails from Chipley, FL, a small town in the panhandle with a rich softball history, and is a graduate of Chipley High School, where she was a team captain on Chipley’s 2013 State Final Four team. Montezuma then attended Chipola College and Florida State University, earning a degree in Biology. Coaching throughout college, Montezuma was an assistant softball coach at Chipley High for five years before taking the reins as Lennard’s head softball coach, where she has thus far compiled a 9-5 record overall and 3-0 in District 9. At Lennard, Montezuma also teaches Biology and Physical Science. The rookie coach looks to bring the Longhorns to their first winning season since 2013, hopefully advancing to the regional playoffs. Last Thursday night, the lady Longhorns traveled to Seffner to topple the Armwood Hawks for the second time this season, 6-3. As usual, the game went back and forth, like two heavyweights going at it in the ring. For Lennard, Kaitlyn Sigmundi went the distance again from the circle against the Hawks, keeping them at bay to secure the win. Sigmundi had help from some great defensive plays by Lauren Robledo, Aniya Reaves and Elycia Cabili. Cabili came through for the Longhorns late in the game, turning in an unassisted double play when Armwood loaded the bases with no outs. Offensively for the Horns, Haley Amorelli’s hot bat went 3 for 4 with an RBI. Haleigh Menendez rocked a double down the third base line to plate three Longhorns,which ended up being the deciding factor in the District 9 battle. Lennard Longhorns softball hitter Elycia Cabili drives in a runner from third with this hit into left field in an offensive donnybrook, finally claimed by Lennard 11-10 over Hillsborough last Saturday. 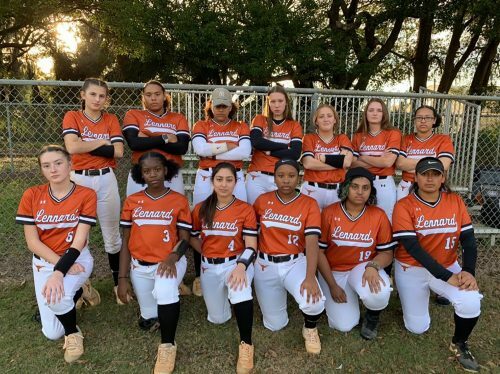 Lennard fought back from an 8-2 deficit to tie the game and fell behind again in extra innings before grabbing a dramatic victory on a two-run, inside-the-park home run by Kiana Bradford in the bottom of the eighth. The game was tied, thanks to a bases-loaded three-run double by the Horns Haleigh Menendez in the bottom of the seventh. The Terriers pushed across a potential winning run on a passed ball in the top of the eighth, but Aniya Reaves led off with a base on balls for Lennard, setting the stage for Bradford’s walk-off heroics. 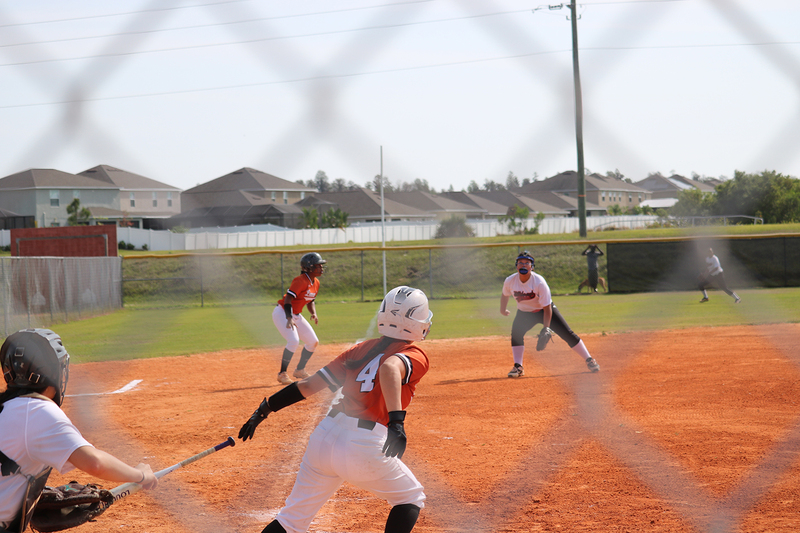 On Tuesday night, March 26, the Lennard Lady Longhorns softball team bussed to Tampa Bay Tech to take on the last place Titans. Lennard thrashed the Titans 20-3 in 4 innings to lift the Longhorns and provide a gleeful ride back to South Shore. The Longhorns were led in the circle by Haleigh Menendez. At the plate the Longhorns offensive onslaught was sparked by Menendez (2 for 4, 3 RBI), Lauren Robledo (2 for 3, 2 RBI), and Kiana Bradford, who blasted a solo home run in the second inning.